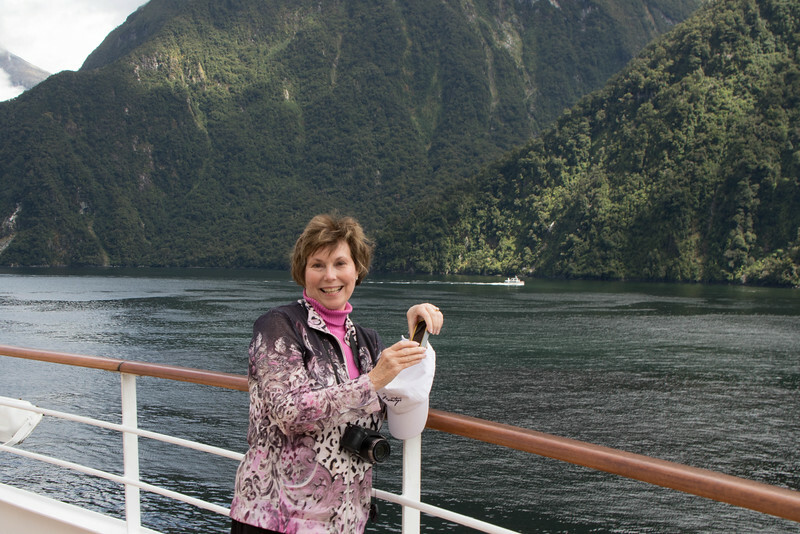 Cruising Milford Sound on a Luxury Cruise Ship. It's fab! Updated: 10.01.2018: The steep-sided cliffs of a fjord mark the entrance to Milford Sound on the West Coast of New Zealand. Standing at the railing on Silver Spirit’s Deck 9, Alan and I marvel as the scenery unfolds in a vertical landscape that undulates in a wave of rugged mountains. Waterfalls — too numerous to count — tumble from the lush, rain-forested cliffs. With an average annual rainfall of 286 inches, we’re cruising in one of the wettest places on earth. Silver Spirit begins her journey into Milford Sound. Misnamed a sound, Milford is actually a fjord created by glaciers during the ice age. Rudyard Kipling described the breathtaking landscape as “the eighth wonder of the world.” And, despite Milford Sounds’ remoteness, it’s one of New Zealand’s most visited tourist destinations, receiving up to one million visitors per year. 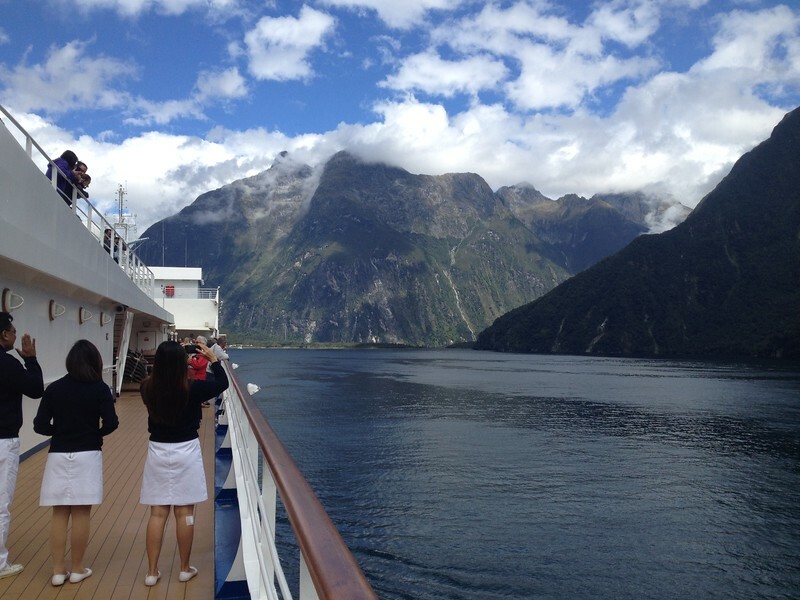 Guests and crew take photos of Milford Sound. On Silver Spirit, the wait staff passes out celebratory drinks to guests who line the rails of the outside decks as they view the grand spectacle that’s a part of Fiordland National Park. Everyone — guests, staff and crew — commemorate the once-in-a-lifetime experience with plenty of photo taking accompanied by oohs, and ahhs. 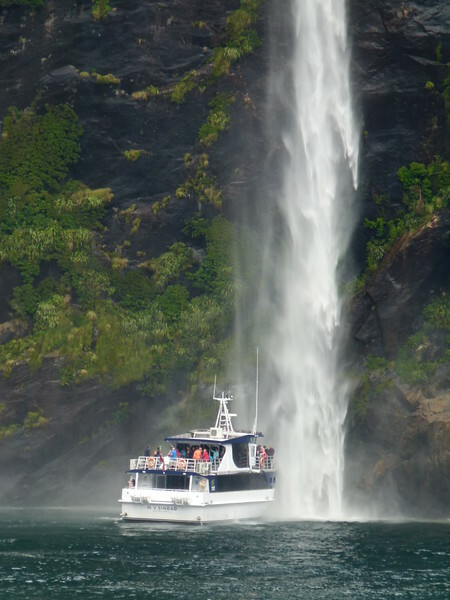 A small tour boat gets up closer and personal with a waterfall. Rounding a curve in the fjord, we see a small tour boat maneuvering as closely as possible to a large waterfall. The tourists onboard are immersed in the mist as the water crashes thunderously into the fjord. Waterfalls are too numerous to count. 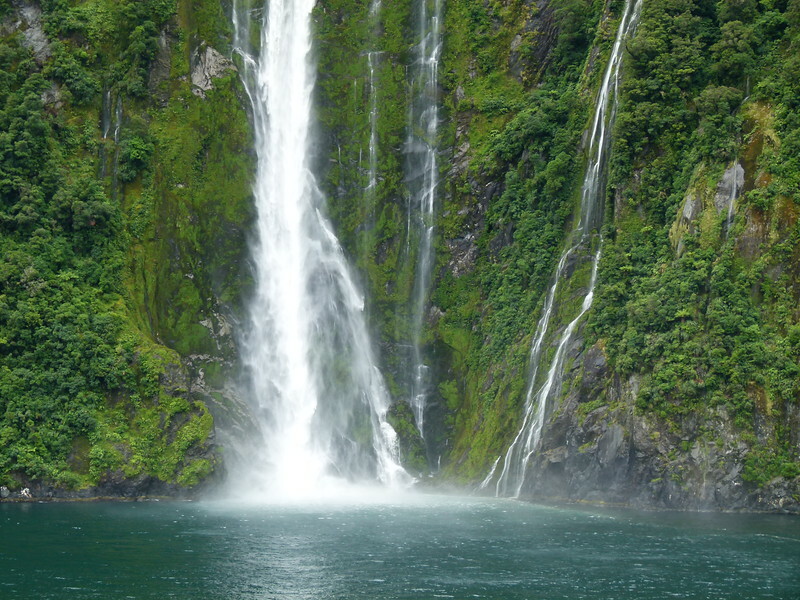 Milford Sound has two waterfalls that flow year round, Lady Bowen Falls and Stirling Falls. But after a heavy rain, hundreds of temporary waterfalls cascade down the sides of the fjord, some dropping as much as 1,000 meters into the sea while others disappear into the wind before reaching the sound. Silver Spirit spends the afternoon majestically cruising up the fjord before reaching the turn around point. From the rail, I see small planes take off from an airstrip. And there’s a lodge for overnight guests who’ve motored by car or bus along scenic State Highway 94 from Te Anu. Other guests arrive after a four-day-walk on the Milford Track, one of the world’s most famous hikes. 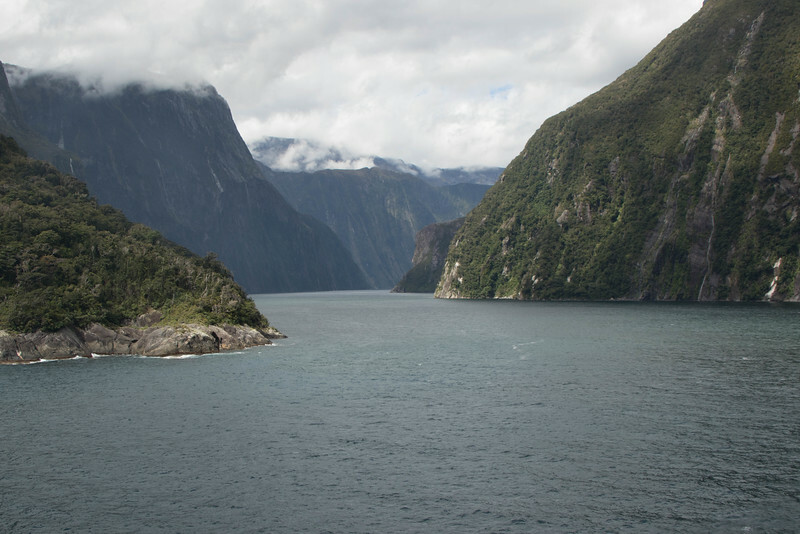 Although we only spot one seal, penguins, dolphins and whales also frequent Milford Sound. Those arriving on a land trip have the opportunity to visit the Milford Deep Underwater Observatory at Harrison Cove to see anemones, 11-legged sea stars and black coral. The return trip back down the fjord offers a new perspective of Milford Sound, once the playground of the Maori and home to Te Wahipounamu World Heritage Site. As the ship exits Milford Sound, Alan and I check off another item on our boomer bucket list. But, as so often happens, it leads to another entry onto the list. Next time, we’d like to arrive on foot having conquered the Milford Track. 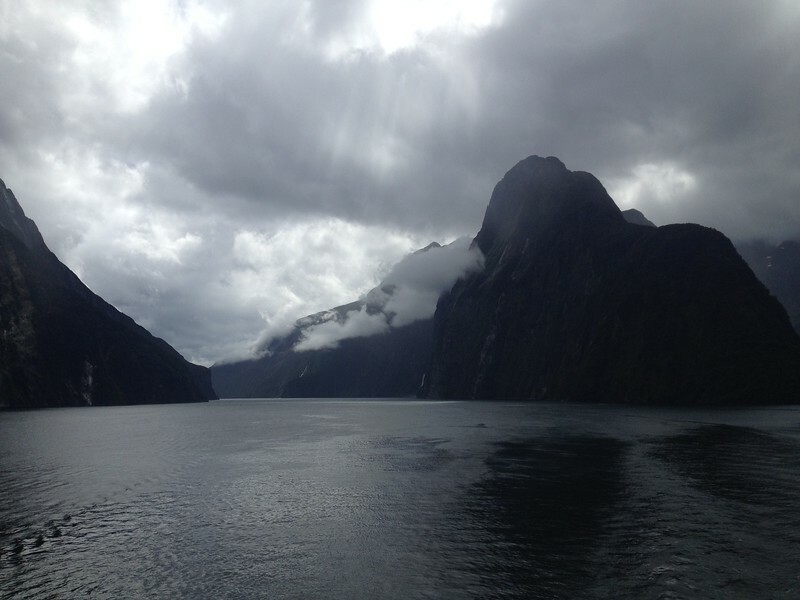 Have you cruised Milford Sound or are you planning a land trip? Come join the conversation at the My Itchy Travel Feet page on Facebook. Or send us an email with your thoughts.